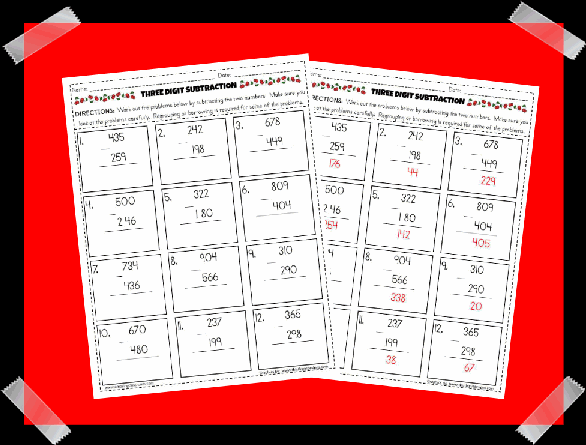 Give your students extra practice with this three digit subtraction worksheet. The students have to look closely as some of the problems require them to regroup or borrow. Give this activity as guided practice, independent practice, or as homework. An answer key is provided easier grading. Enjoy! 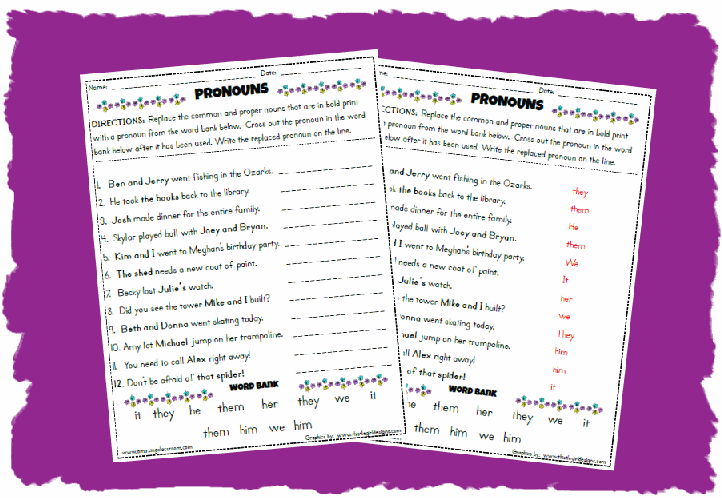 This worksheet will give your students extra practice on replacing common and proper nouns with pronouns. An answer key is provided for grading. Use this activity in addition to our flipchart lesson on Pronouns as independent practice or homework. Enjoy! 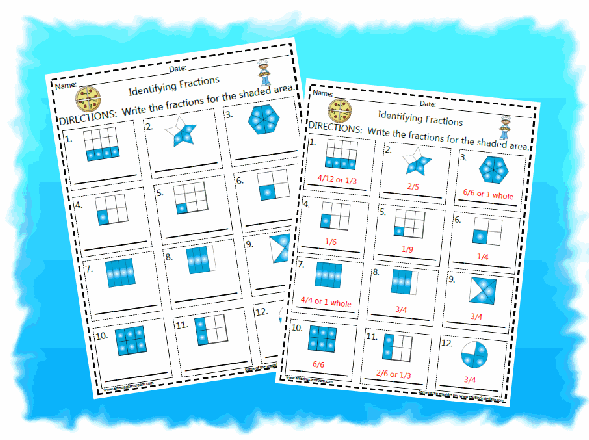 This worksheet will give your students more practice with identifying fractions. Give this activity before you teach this concept as a formative assessment or as homework for more practice. Enjoy! 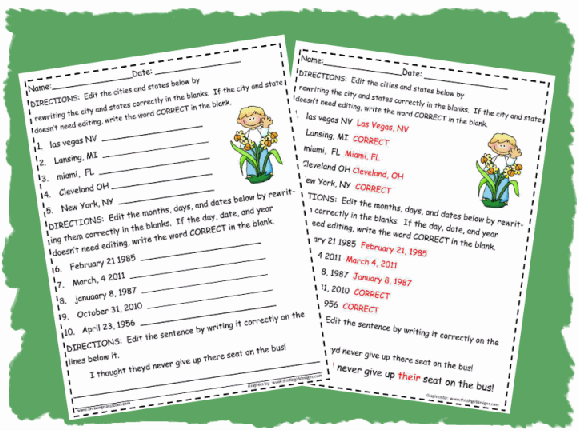 This activity pages helps students practice editing cities and states along with dates. The students will get practice identifying whether an item is written correctly, or incorrectly. A challenge question is included at the bottom. 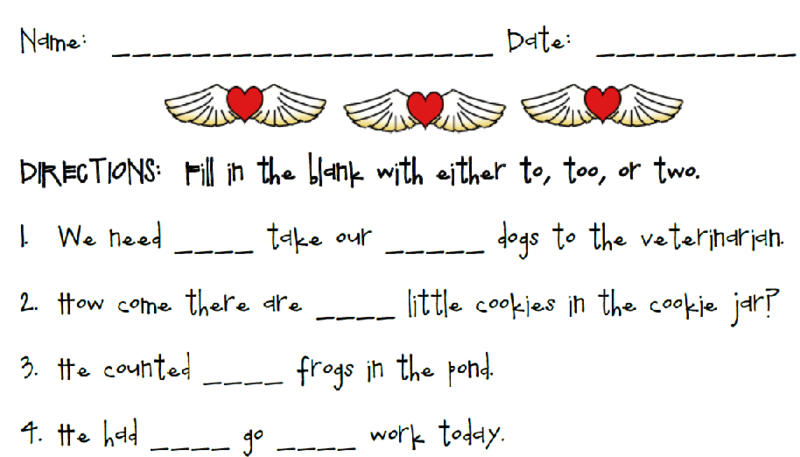 Use this worksheet prior to using our Homophones - To, Too, and Two worksheet. Use it as a formative assessment first, and then after you teach the concepts use it as a summative assessment. 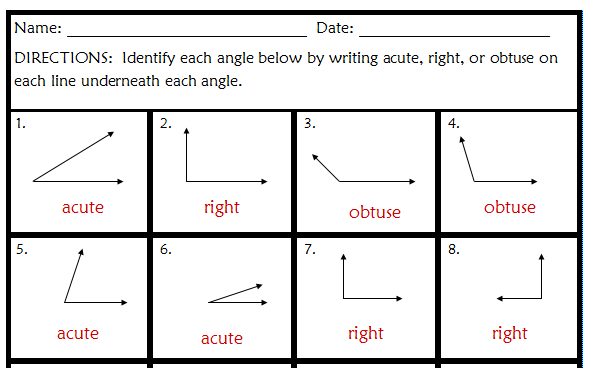 Or, maybe you will choose to send this activity as homework practice for your students. Enjoy! 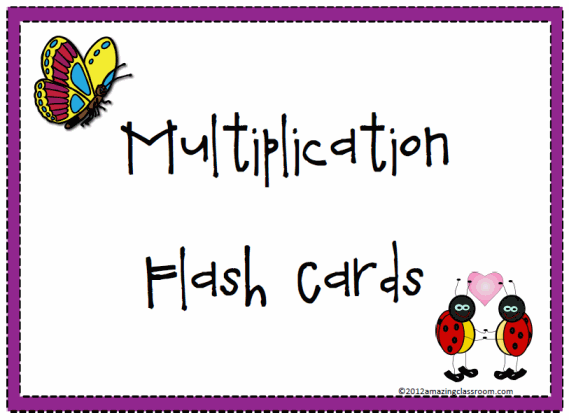 Do your students need practice with the memorization of their multiplication facts? Download and print these cute and adorable math fact cards to help your students master these facts! Enjoy! 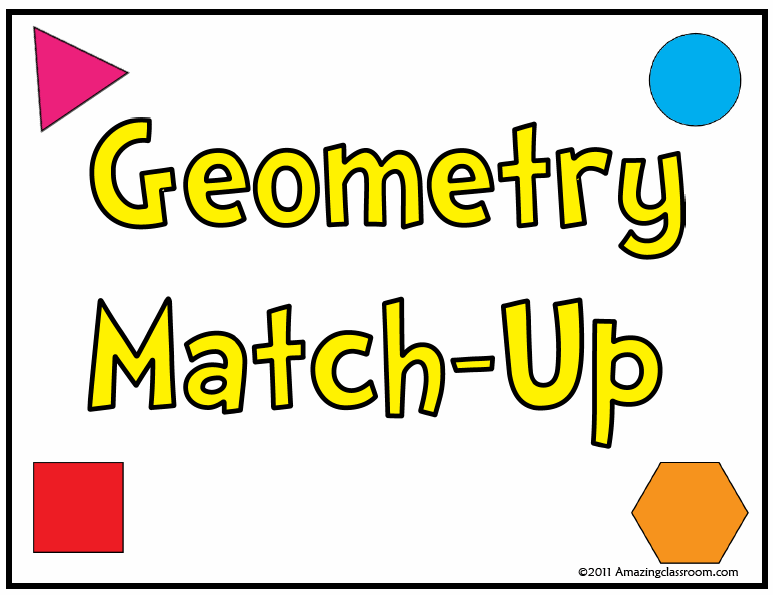 With this game, your students will be able to identify the following shapes: three different types of triangles, irregular and regular hexagons, pentagons, octagons, nonagons, decagons, a square, rhombus, rectangle, circle, quadrilateral, and parallelogram. The game is similar to memory. There are 42 cards provided and can be printed back to back on white card stock and laminated. All directions and assembly instructions are included! Enjoy! 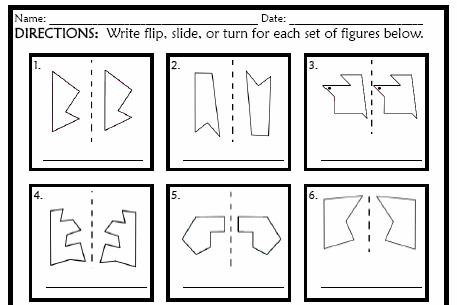 This activity page contains twelve sets of figures that your students have to identify as being flipped, slid, or turned. Use this as a formative assessment before our "Flips, Slides, and Turns" flipchart lesson and after, as a summative assessment to see what your kids have learned. Enjoy! This activity contains twenty angles that students have to identify as either right, acute, or obtuse. Use as a formative and/or summative assessment before or after a lesson to see what your students know and have learned. Answer key is also provided. Enjoy! 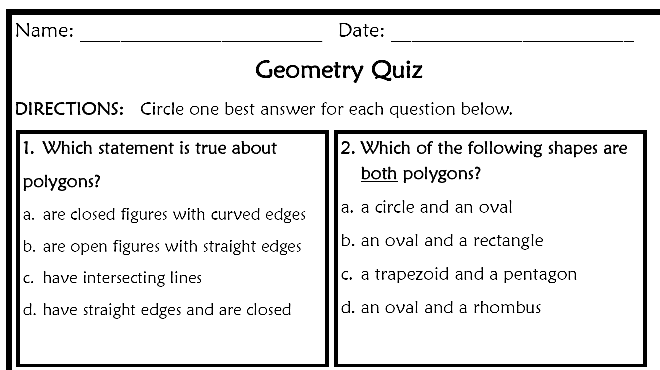 Test your student's knowledge of geometry with this geometry quiz. This quiz covers polygons, angles, area, 2-D shapes, and perimeter. You could use this quiz as a formative assessment prior to teaching these concepts and as a post test to see what your students have learned. Answer key is provided to make grading easier. Enjoy!